do you think you could fit the RFM69W modules? Probably, there should be enough space. 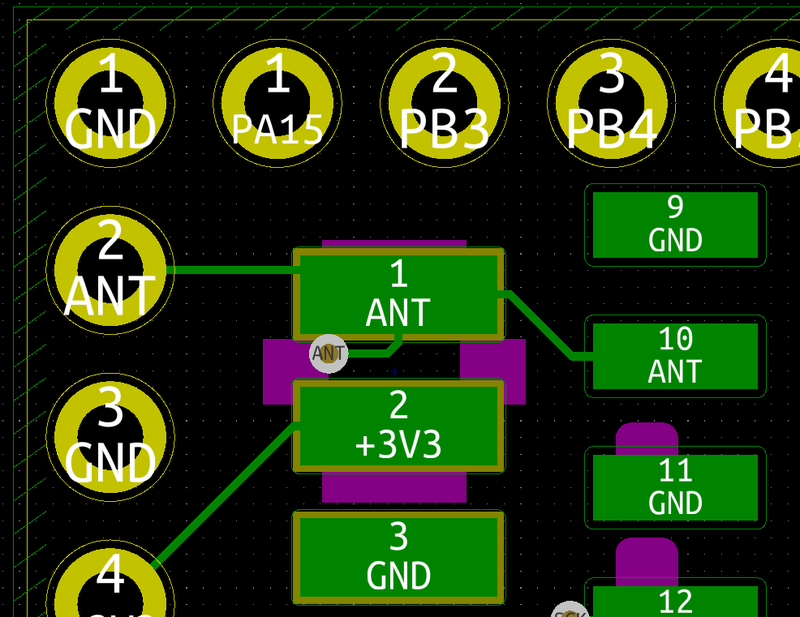 It would probably require a bit of work as well to move vias around. I ordered my 3rd batch of prototype boards yesterday and will hold making changes now until I can test. Adding RFM69W (or RFM69HCW for that matter) support is not really a priority for me to be honest since the CW modules should have the same performance and HW is out of the question due to legislation in my country (25 mW e.r.p. for 868Mhz). So my question: would that be something you really need? Yes I know, I didn't say otherwise. It would be nice if you could post a .pdf of the schematic.... not everyone has the tool to see the board from the .sch file. @lafleur: sure, I added the pdf. @gohan: I added the RFM69(H)W footprint as an exercise. You can find it here https://github.com/freynder/STM32_Sensor. I will not update the design files here as I'm waiting for the prototype boards for V3.4 to test and update the results here so it remains consistent. Not sure how evolutions are supposed to be handled on openhardware.io... create a new entry? Ok, keep us posted. Also make sure about trace length for the antenna as I remember there should be some specs about it. @gohan: what do you mean exactly? I kept antenna connections very close together. They also lay in a ground plane: http://i.imgur.com/KzE7CXc.png . the "10 ANT" pad is not very close to the ANT hole, are you sure it is not affecting the antenna length? @gohan: I'm not sure. The antenna trace is surrounded by the ground plane up to the ANT hole so I assumed antenna length would need to be measured from there but that might not be correct. I'm not 100% sure though and don't know how much of an impact it might have. I will test both lengths once the boards arrive. Any insight would be appreciated. Assembled and performed a few simple tests: upload using SWD, upload using serial (using buttons to select boot mode), running securitypersonalizer and basic mysensors sketch with RFM69 initialization. Everything seems to be working. More extensive tests will be performed later. @freyender - nice project, perfect for my needs. So I got a couple of boards from OSHpark, ordered some parts online then I went to populate one of the boards and realized there's no silkscreen for parts! Do you have an overlay or something that tells me which part goes where? Or am I being thick and missing something that is right under my eyes? Thanks! @ian1scott: sorry for the late reply. The part references can be found in the Fab layer in the kicad file. Nice board. Have you run it on battery? How is the power consumption? Power consumption should be comparable to the blue pill with leds and regulator removed. Never got around measuring it myself but here are some results for the bluepill: https://www.stm32duino.com/viewtopic.php?f=3&t=658&start=40 , stating 13µA in STOP mode. Also note that last time I checked, low power was not supported in MySensors for these MCU's so you would need to add it in yourself.